Show times daily. See below for full schedule. 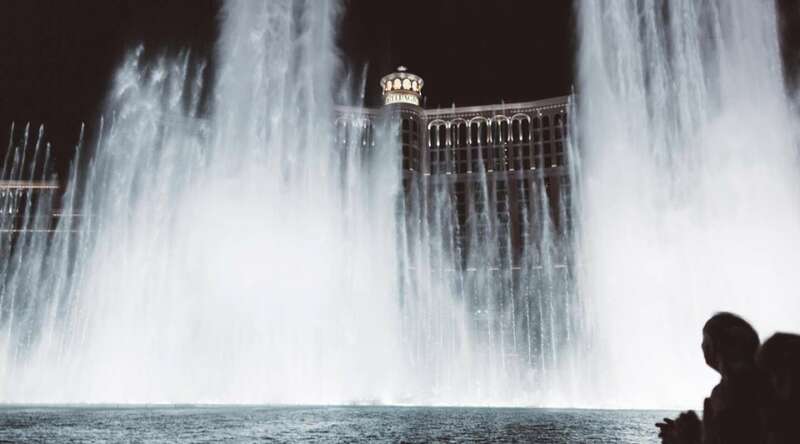 What time is the Bellagio Fountain Show? The Fountains of Bellagio is a daily show in Las Vegas. The show is every 30 minutes from 3pm to 8pm Monday through Friday and every 15 minutes from 8pm to midnight. On Sundays the show starts at 11am every 30 minutes until 7pm when the show goes on every 15 minutes until midnight. On Saturdays and Holidays the shows start at noon every 30 minutes and change to every 15 minutes at from 8pm to midnight. Shows are subject to cancellation due to weather. A wide range of musical works has been selected for the fountain’s shows, from classical and operatic pieces to popular music and songs from Broadway. Designers, musicians and performance artists were invited to choreograph the fountains to these differing musical selections. The result is a rich, dynamic collection of performances in water, each uniquely expressive in its interpretation. The performances range from delicate and whimsical to grand and commanding. Note: Schedule may vary. Shows are subject to cancellation due to weather. Artist: Lady Gaga. Composer: RedOne, Lady Gaga. Artist: Original Broadway Cast. Composer: Marvin Hamlisch. Title: Fly Me To The Moon. Artist: Frank Sinatra w/ Count Basie Bart Howard. Composer: Bart Howard. Artist: London Symphony Orchestra. Composer: Aaron Copland. Title: Singin' in the Rain. Artist: Gene Kelly. Composer: Alex North. Artist: Luciano Pavarotti. Composer: Vicenzo de Crescenzo. Artist: Catherine Zeta-Jones. Composer: Fred Ebb & John Kander. Title: God Bless The USA. Artist: Lee Greenwood. Composer: Lee Greenwood. Artist: Whitney Houston. Composer: Francis Scott Key. Title: The Ecstasy of Gold. Artist: Henry Mancini. Composer: Henry Mancini. Artist: Mark Ronson feat. Bruno Mars. Composer: Mark Ronson feat. Bruno Mars. Title: Luck Be A Lady. Artist: Frank Sinatra. Composer: Frank Losser. Artist: Gwen Verdon & Original Broadway Cast. Composer: Cy Coleman. Title: Con Te Partiro (Time to Say Goodbye). Artist: Andrea Bocelli & Sarah Brightman. Composer: F.Sartori, L.Quarantotto. Title: Rhapsody on a Theme of Paganini. Artist: Mikhail Rudy. Composer: Sergei Rachmaninov. Artist: Elvis Presley. Composer: George E. Stoll. Title: Lucy in the Sky with Diamonds. Artist: The Beatles. Composer: John Lennon & Paul McCartney. Artist: Ralph Carmichael. Composer: Glenn Miller. Title: My Heart Will Go On. Artist: Celine Dion. Composer: James Horner. Lyrics by Will Jennings. Artist: Mormon Tabernacle Choir Cast. Composer: Handel. Title: Carol Of The Bells. Artist: Los Angeles Master Chorale. Composer: M. Leontovich. Artist: Placido Domingo. Composer: Placide Clappeau. Title: It's Beginning to Look a Lot Like Christmas. Artist: Johnny Mathis. Composer: Meredith Wilsom. Title: The Most Wonderful Time of the Year. Artist: Johnny Mathis. Composer: Eddi Pola & George Wyle. Artist: Johnny Mathis. Composer: Leroy Anderson. Artist: Madonna. Composer: J. Javita & P. Springer. 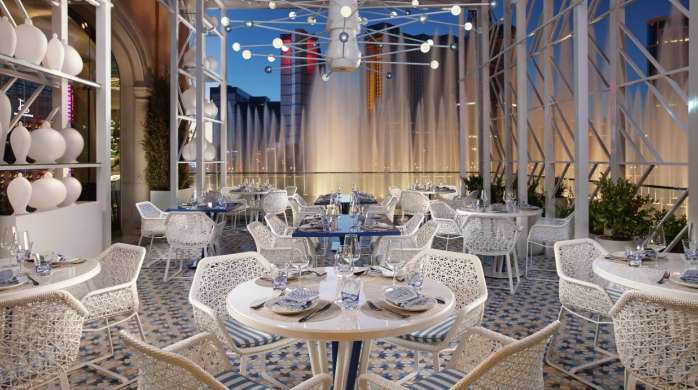 Bellagio welcomes you to enjoy our collection of outdoor dining establishments that feature a magnificent view of our Fountains. A curated collection of dining options right on Lago di Como adds a majestic ambiance to your meal. Join HYDE for a seamless indoor-outdoor Nightclub experience with floor-to-ceiling windows. 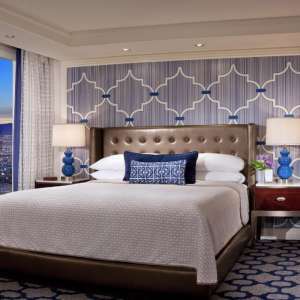 With an expansive terrace overlooking the stunning Fountains of Bellagio, you’re able to watch the Fountains every 30 minutes starting at 5pm.